You've defeated the evil Wizard Malkil before. So you can defeat him again. Or can you? This time he has summoned the very forces of Nature against you. He's taken the form of the four Elementals: Wind, Water, Fire and Earth. And though your fighting abilities are the finest in the land, it will take more - much more - to go against these all-powerful Elementals. You must search everywhere for the food, items, and spells that are your only hope for victory. Leave no stone unturned. No door or chest unopened. Gather or purchase the keys that open the sealed chests. Do whatever it takes to harbor magic spells and powers. And collect all the gold and precious treasures you can find - because there may be times when you have to buy your strength. Within each of the four domains - those of Wind, Water, Fire and Earth - you will be able to call on the assistance of an Animal King. But only of you can bestow upon him the golden object which he so desperately seeks. Finally - at the end of each domain - you must battle the Elemental itself. It won't be easy. And if you don't first obtain the magic that each Elemental fears the most, it will be impossible. But if you do find the right magic for the job, and you defeat the Elemental, you will be given a piece of the shattered Ironsword. When all four Elementals have been defeated, you will hold the completely restored IronSword - the only weapon powerful enough to defeat the wicked Malkil. But, as it is with any battle against the evil Wizard, almost everything you encounter will be under his spell. Which means his minions are bent on carrying out only one task: stopping you. And as it is in any kingdom controlled by the power of magic, things aren't always as they appear. They way up may be to go down. The path to the West may lead off to the East. And hidden passages may lead you to places where "direction" has no meaning. --From the NES Wizards & Warriors 2: Iron Sword instruction manual. 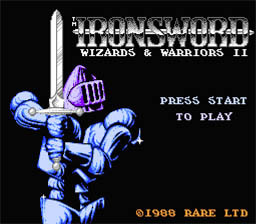 Play Wizards & Warriors 2: Iron Sword Now!